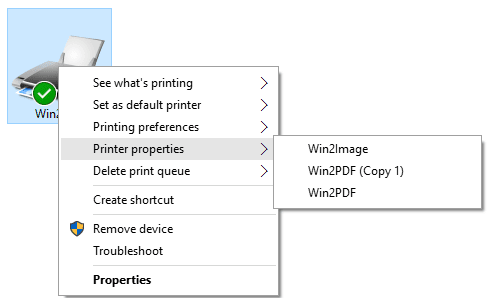 Settings for each Win2PDF printer are stored separately, so you can set up multiple copies of Win2PDF for settings required by different applications. This can be very powerful when combined with the Auto-name feature. There is no cost to add a new Win2PDF printer instance to the same computer. If creating many instances, you should rename each instance before configuring the instance.